Zoonotic Diseases are those passed from animal to human. Here are just a few: Whipworms, Hookworms, Tapeworms, Roundworm, E. coli, Salmonella, Q Fever, Rabies, Ringworm, Rocky Mountain Spotted Fever, Listeria, Giardia, Lyme Disease, Campylobacter (causes diarrhea in humans), Clostridium Perfringens, Cryptosporidium, Adenovirus, Brucellosis, Leishmaniasis, Leptospirosis, Toxocariasis (caused by roundworms, infection often does not have noticeable symptoms, but may cause a cough, rash, fever, or even blindness). 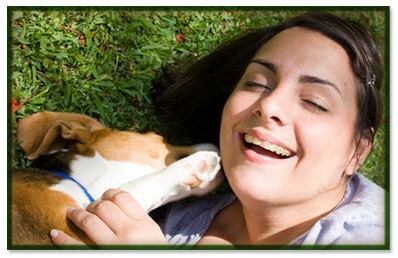 For more information on these illnesses refer to The Centers for Disease Control – Diseases from Dogs. It’s recommended that dog feces be removed as soon as possible, especially before it rains heavy. If dog feces are not scooped these organisms will seep into the soil and eventually contaminate our water supply also!